A friend of mine was blessed with a baby girl about 5 months ago, her fifth child. Her baby is absolutely beautiful and I think her family is great. Recently, I found out this same friend is pregnant with her sixth child. I'm so happy for her, but I felt as if I had been punched in the gut. It was salt on a wound I thought had healed. Sometimes grief over infertility unexpectedly hits me again and then I feel guilty for grieving because I have been blessed with a beautiful daughter through adoption. I recently read this article written by Melissa, an adoptive mom. She does a beautiful job of painting the complex feelings of grief & gratitude felt among those involved in adoption. Her insights could be applied to many different situations. I love how Melissa described that grief does not negate gratitude. They can coincide. "Grief and gratitude can live side by side, nonthreatening to each other." You can read her article below or click here for the original post. Over the past 5 years, I’ve been blessed to become a mom twice. Despite our infertility diagnosis, my dream of becoming a mother came true and my children are more beautiful, inside and out, than anything I ever could have created. I stand back and stare at them in awe, fully aware of God’s plan, sometimes feeling grateful for the infertility that led me to my children. I would have willfully chosen infertility if I’d known the two children I have would be mine because of it. But the truth is, the decision to hand my fertility over wasn’t in my hands. That decision was made for me, and there was a period of tremendous loss and mourning that accompanied the official diagnosis. My husband and I had discussed adoption when we were dating, and we’d even had talks about whether either of us really wanted biological children or not. We’d come to the conclusion before getting married that the only way we’d build our family–by choice–was through adoption. But one afternoon, when I sat there with a pregnancy test in my hand, waiting for one line or two, something in me flickered. A light had been turned on and there was no going back. I felt fiercely protective of this might-be life inside me. In the blink of an eye, I went to someone who didn’t want to be pregnant to someone who could only think about being pregnant. I remember going in for the blood work, the tests, and procedures. I remember a doctor telling me maybe losing a little weight would jump-start things (on the way out, I bumped into a woman who weighed about 100 pounds more than me with three children at her feet), and how terrible that made me feel. I remember the shots, the surgeries, and how I got used to doctors poking and prodding. I was stripped of my modesty and by the time I was wheeled into surgery for a full hysterectomy, I was almost glad to see the door slamming shut. Something needed to feel final. We didn’t need to be in flux anymore, and my heart couldn’t take one more month of wondering if maybe, just maybe, a miracle had happened. That surgery was almost four years ago, and I’ve found a place of peace with our infertility, especially after we’ve been blessed with our children. Don’t get me wrong, though; adoption is NO cure for infertility. These children who call me “mommy” are no Band-Aid. They don’t carry the burden of fixing me or making me a happy person. They are merely lights that lit my life up, gave me a reason to focus on something other than myself, and little reminders that life is about more than control and choosing our own destiny. They show me that life is about seeing that what we’re blessed with is oftentimes so much better than the plans we made ourselves. Despite the work I’ve done in understanding and coming to terms with my infertility, I’m not immune to that one “off day” when something happens that makes me heavy with grief. There’s usually a trigger of some kind. A pregnancy announcement, seeing a parent mistreat her child, finding out someone is having an abortion, hearing someone complain about their pregnancy, getting stuck in the midst of a conversation about a pregnancy you’ll never experience, an article like this, and—the worst for me—movies. I get so emotionally lost in a good movie and, one evening, I found myself in a puddle of tears as I watched a woman experience childbirth. With her husband at her side, ethereal lights glowing around her, the first cry is heard and the baby is raised, surrounded by light and love. There, in that moment, I wept for myself and the experience I’d never have. I cried for my husband and for what I couldn’t give him. I wallowed in it for a while, sobbing until my eyes stung. Then a voice in my brain said, “You’re selfish. You should be grateful. You have two beautiful children who two other women would give anything to be parenting right now. You have no right to feel this grief, because you’ve been blessed in a different way. You need to pull yourself together.” I fell asleep that night feeling no better about my infertility, just guiltier for being human. The next morning, I let myself off the hook. I licked my wounds and realized that I’m allowed to grieve this anytime I need. I can’t let it get the best of me, and I can’t let it consume me, but I can allow myself the tears because the loss we’ve experienced will never go away. I’ll grieve in new ways, like the first time I cried because I realized I’d give anything not to just feel any baby in my belly—but my babies. These two children whom I love no differently than if they were my own flesh and blood began their lives with different women, and I’ll never know what their kicks feel like. It’s painful, and I’m allowed to be sad. Then I experienced the first time my child grieved because he wasn’t carried in my belly. That’s when the most important flickering happened inside me. Not in my belly this time, but in my brain; I realized how much my children and I have in common. Everything I’ve experienced gives me a place of understanding for the loss my children will feel some day, the emotional bruises they’ll carry from being an adoptee, and the pain of realizing a choice was made for them. The question of whether to be raised by their family of origin or not—was stripped from them. They were not a part of the decision. Grief and gratitude are parallel issues. They are allowed to coincide. They don’t contradict one another and they don’t cancel each other out. They are valid feelings that can be felt alongside one another, and we can’t ever assume that feeling grief makes us ungrateful. I can grieve my fertility while still feeling overwhelmed with how thankful I am to have the two children I’ve been blessed with. I can say I’d hand my fertility over in exchange for knowing I’d be the mother of these two amazing children, but it doesn’t mean having a decision made for me feels good. My children can grieve the loss of being raised alongside their birth siblings while still loving and feeling thankful for each other–the siblings they’ve been raised with. They can say they would have willingly chosen a life with us if given the opportunity, but we will never be a cure for our children’s loss. We can be lights in their lives, teachers who give them opportunities to learn and grow, and the people who remind them that they belong to families–both biological and adoptive–in equal amounts. As adoptive parents, we have a responsibility to our children. We have to listen and allow them to express their feelings without misinterpreting their pain as something personal. We can’t be threatened by the loss they feel, acting needy and asking them to validate their love for us. We are important to our children, and they can love their life and grieve their loss at the same time, just as we can. 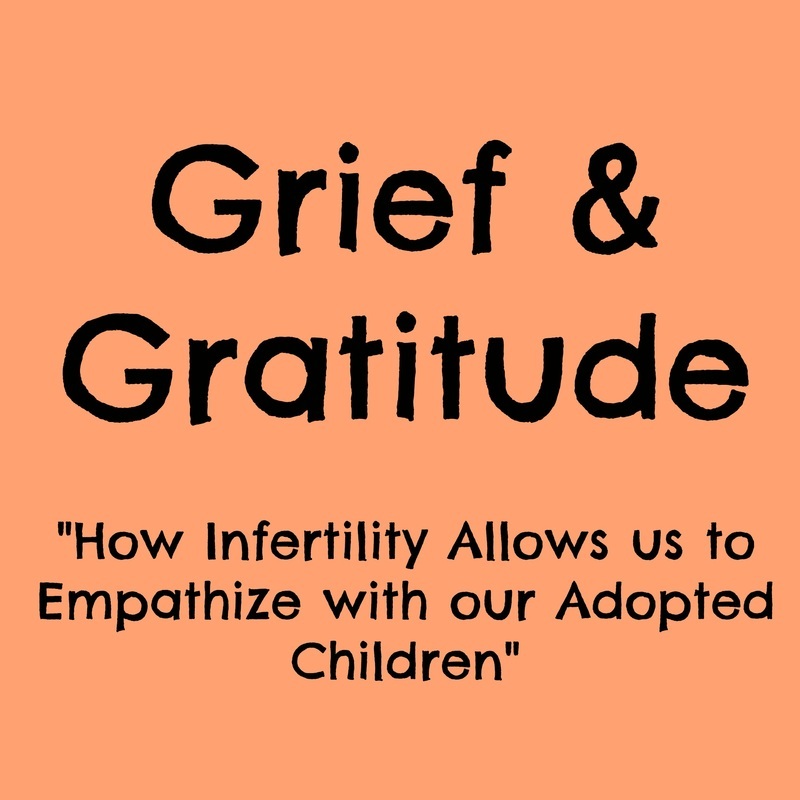 We’ve experienced pain the other can understand, and that puts us in a unique position to truly empathize with what our children are feeling as they process the grief of choices made for them while simultaneously appreciating the beauty that came as a result.